Let us address the inconsistencies in these assumptions issued by those, who consider themselves the paragon of accurate journalism, fit to set and criticize reporting standards for all. Then, we will proceed to examine the domestic Russian media landscape, focusing on political, economic, and social (i.e., non-entertainment) issues. Let us also agree to define “propaganda” as not simply sharing information that promotes a particular view point—no one is immune to that—but, rather, as sharing information that is deliberately misleading, one that may include purposeful omissions, especially when counter-facts are readily available. First, the Western world most certainly owns and operates state, that is, taxpayer-funded, media, some of which specifically targets audiences abroad and predates the likes of Russia’s RT—the usual scapegoat of the aforementioned accusations—by decades. Britain’s BBC, Canada’s CBC, Germany’s Deutsche Welle, as well as America’s PBS and, well, Voice of America are some of the most obvious examples. Thus, the argument about ‘state-owned propaganda’ that is contextually meant to contrast the ‘free’ West with ‘authoritarian’ Russia contradicts itself from the onset. After all, if the assumption about lacking pluralism only pertains to state media, as such, then it affects the aforementioned European and American networks as well. Second, the notion that large corporate entities spend billions on media without having a stake in content, narrative, ideological slant, and advertising defies the very purpose of being a for-profit organization. In fact, in the last few decades, the number of companies owning and operating major networks and publications in the U.S., specifically, decreased from 50 to 6. This means that the same corporations are pushing the same interests, or even personal views of its owners, across a misleading diversity of platforms. ISIS, Putin, Iran free to run amok while all western nations continue to wind down defense abilities. Third, the content and analysis in non-state Western media about the subjects of geopolitics or international relations not only sound like each other, but also like the official narrative from Washington and Brussels. Take the increase in demonizing Russia, in general, and Putin, specifically in the last number of years. Whereas, the ‘Russia is finished‘ narrative has consistently appeared since Putin’s first presidency, the country’s return to world politics after 1990s collapse, especially with brokering the chemical-weapons deal in Syria in 2013, has increased the unjustifiably critical and, sometimes, comical information onslaught exponentially. Then came the needless tarnishing of the Sochi Olympics, Ukraine’s Maidan-as-a-peaceful-protest coverage, Crimean ‘occupation’ despite the referendum, Russia’s weekly ‘invasions’ of Ukraine, blaming Putin for the MH17 crash minutes after it occurred, and, as of this moment, criticizing the Russian anti-terrorist operation in Syria upon that government’s invitation. Of course, some of this coverage gets refuted later, but the initial impact is meant to cause the maximum informational damage possible. The echo-chamber effect does not necessarily mean that Western-media journalists are cooperating with the government, though sometimes it does, as was the case with the Julian Assange interview with 60 Minutes in 2011. What it does mean is that sometimes corporate and state interests coincide—when U.S. Vice President Joe Biden’s son joined the board of a Ukrainian gas company, for instance—or simply that journalists are operating within the same ideological milieu. Of course, that is not an excuse to leave out easily accessible pieces of information that would affect one’s narrative, not know the language of the country, where one claims his supposed expertise, or, for that matter, never travel there. Now, let us have a look at the Russian media landscape, addressing the so-called opposition first. Echo of Moscow (Ekho Moskvy) radio; TV Rain (Dozhd); Novaia Gazeta, Gazeta.Ru, Grani newspapers, among others are some of the most obvious examples of ideologically Liberal media mimicking mainstream Western opinion, sometimes as a hyperbole. Certain celebrities and media personalities, like Ksenia Sobchak, currently of TV Rain, push similar agenda through social networks to hundreds of thousands of subscribers. These platforms continually feature content that is near-identical to that of Russia’s current demonization in the West—from the ‘invasion’ of Ukraine to ‘not bombing ISIS’ in Syria. Some are affiliated with Western state-funded sources, like the Voice of America in the case of Grani and TV Rain. These platforms represent the opinions of less than 10% of Russia’s population, specifically young affluent urbanites. Yet it is they that get overrepresented and idealized in the Western media. At the same time, there are other kinds of media opposition, or, at least, those, who question some of the Kremlin’s key decisions, whose opinions are never heard in the West. This includes, for instance, a traditionalist, socially conservative newspaper Zavtra and its TV channel Den’, known for its criticism of the ideologically Liberal aspects of post-Soviet Russia. In the early 1990s, West’s ‘democratic’ darling Yeltsin went as far as to ban the older version of this publication. Today, it supports what it describes as the patriotic trajectory. However, that does not necessarily coincide with the Kremlin’s actions. Some of its contributors pushed for a military intervention in Ukraine to overthrow the post-Maidan Kiev government—after the latter attacked Donbass—contrary to Moscow’s efforts with Minsk-1 and Minsk-2 agreements. Thus, the Western media overrepresents one kind of opposition—one that parrots its talking points—and completely ignores another. This follows a similar trend of reducing the so-called civil society in Russia to pro-Western ideological Liberals and overlooking socially conservative Orthodox, monarchist, and Cossack groups, because they do not fit the required narrative. Much of the Russian media is indeed state-owned or affiliated. As such, it adheres to the general trajectory of Kremlin’s politics. But we have already seen that corporate media effectively functions in the same manner. Also, let us not forget that these politics are supported by an overwhelming majority of Russians, fluctuating at over 80% since 2014. More important, this does not mean that opposing view points remain unheard, or that political talk-show hosts have no freedom of expression. Diverse opinions are aired on a daily basis on the biggest political programs in prime time and, often, live, that is, with little-to-no editing. Compare that approach to the partial censorship of Putin’s recent interview to the U.S. media. 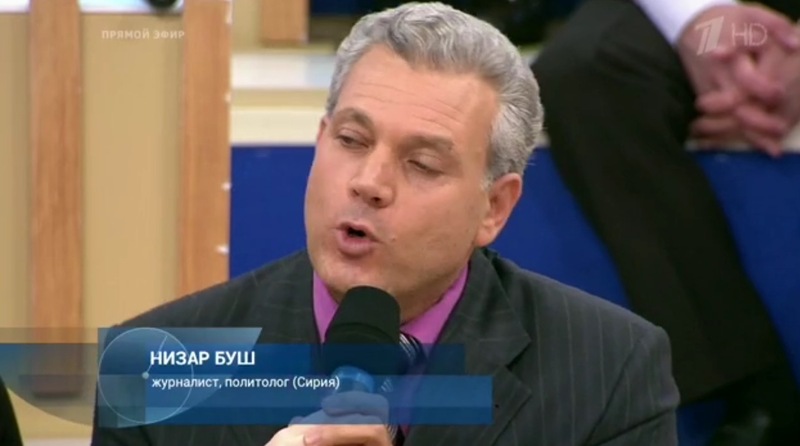 Contributors to Russian state television include journalists, opinion-makers, and even political officialdom from the United States, Germany, Czech Republic, Finland, Poland, Greece, Turkey, the Baltic states, Ukraine, and Syria, not to mention the ideologically Liberal opposition beloved in the West. Some represent their national interests, others—views that harshly oppose those of the Kremlin. Want to witness Syrians debate the country’s political situation? 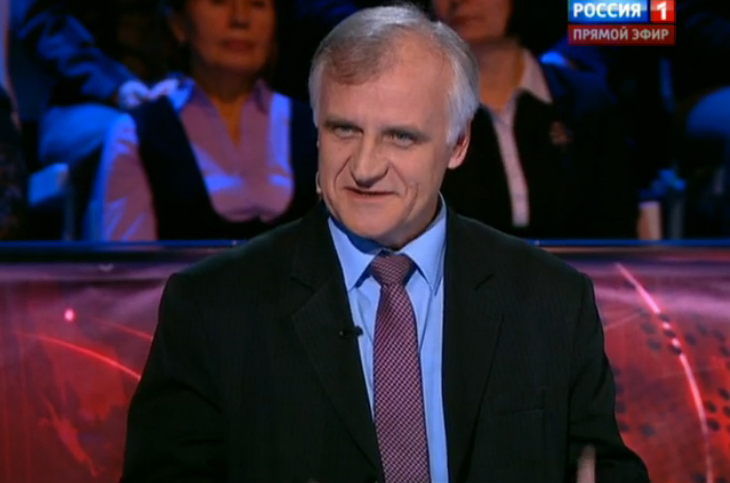 How about Donbass representatives argue with political scientists from Kiev? Channel 1 or Rossiia are happy to oblige. Here is a small selection of foreign contributors to Russian state television, many of whom are quite critical of the Kremlin, over the past year. The following tweets are from the Russian military expert Igor Korotchenko and his television appearances over the past month alone. 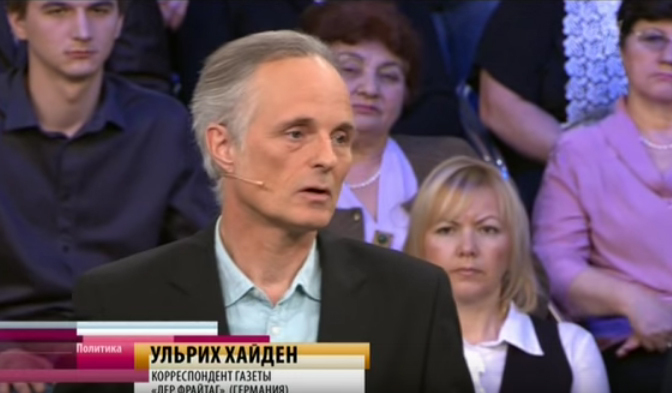 Michael Bohm and Ukrainian political scientist Vyacheslav Kovtun, a supporter of the current Kiev regime, at Ostankino television. 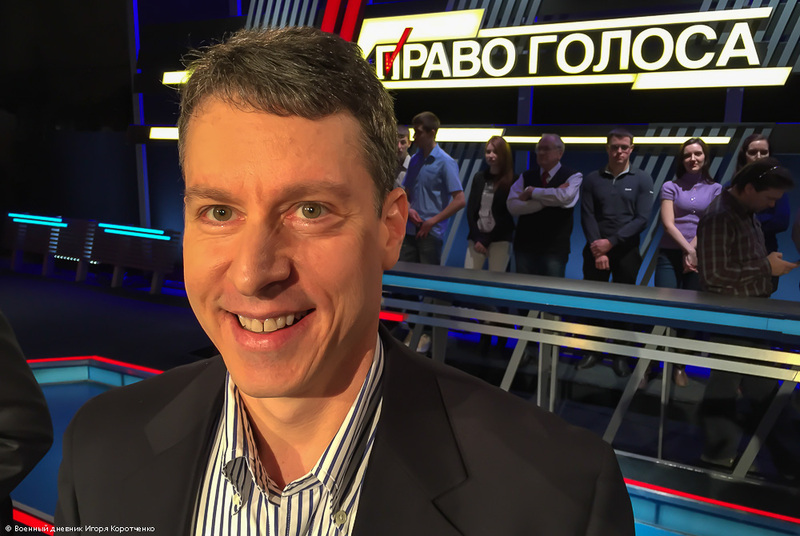 It is important to note that many of these and other contributors make regular—weekly, if not daily—appearances on Russian state television beyond this small selection. Now, how often do you see the equivalent—officials, opinion-makers, and journalists—on Western television, particularly those that represent the mainstream Russian point of view? 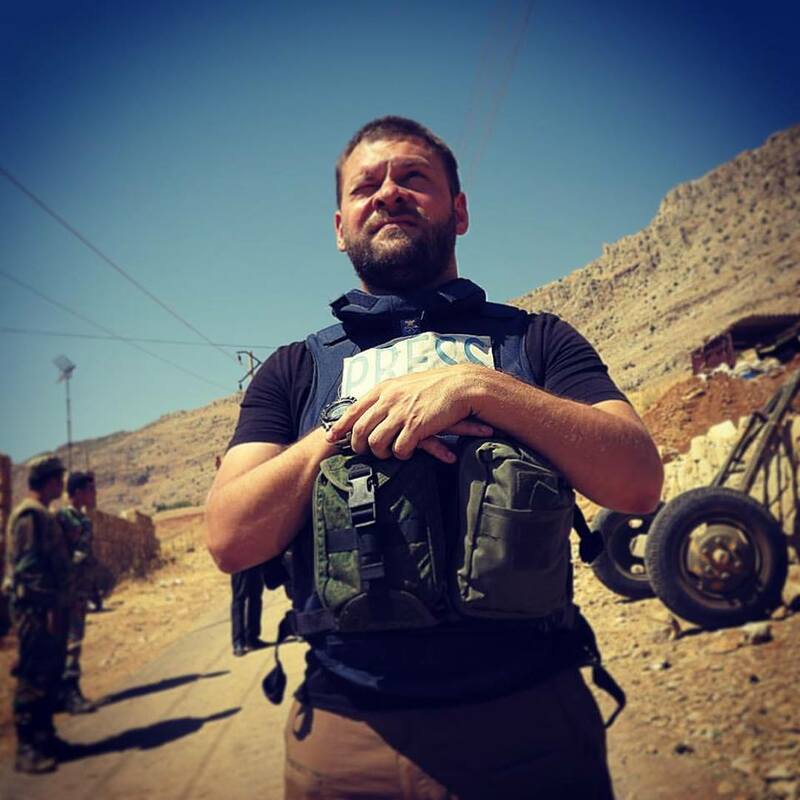 Evgenii Poddubnyi of Rossiia Channel, Syria, September 2015. Source: Instagram @epoddubny. In Donetsk, an entire hotel is packed with Western journalists, whom I have never seen outside, that is, at the front, at militia’s positions. Their principle is as follows: they find local stringers that go off somewhere to do the shooting, bringing back some kind of footage. [These journalists] then portray someone else’s emotions as their own. 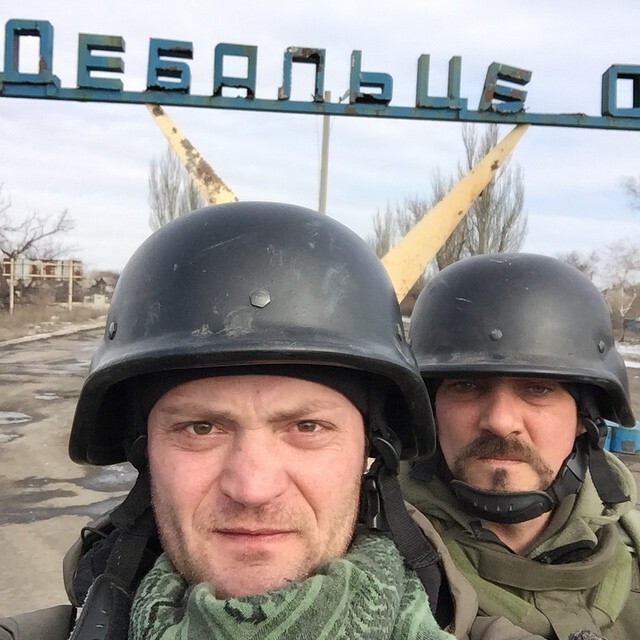 Sasha Kots and Dmitrii Steshin, Komsomolskaia Pravda, February 2015, Debaltsevo, Donbass. Source: Instagram @sashakots. Of course, foreign relations and geopolitics are not the only subjects, contrary to what some would have you believe. Indeed, some of the biggest political talk shows, such as the aforementioned daily Time Will Tell (Vremiia Pokazhet) often splits its air time 50% / 50% with a news segment in between. From the rising commodity prices, certain failures of school education, and quality of medical care to the crackdown on yet another corrupt governor, dozens of experts and audience members exchange fiery commentary, in between a barrage of statistics. 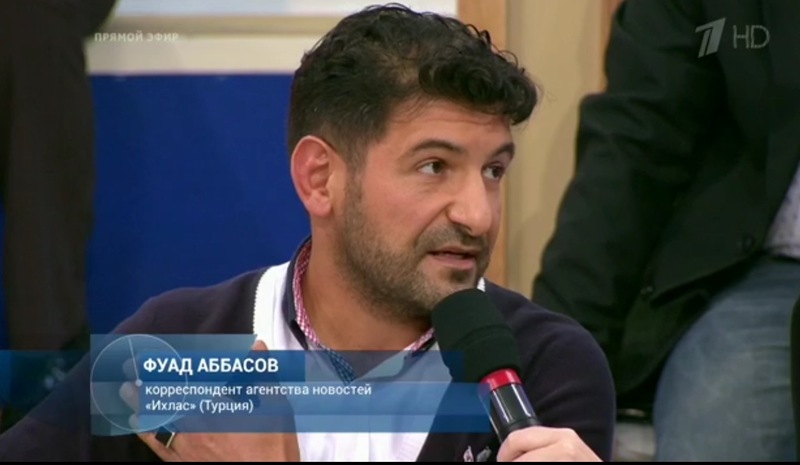 Time Will Tell (Vremiia Pokazhet), Channel 1, criticizes regional officials for excessive budget spending on airfare. Writing from abroad? All of this programming is available at one’s fingertips to either view directly on the country’s television websites 1TV.ru, NTV.ru, and RUSSIA.tv, among others, or on Youtube from the comfort of one’s home in just about any part of the world. 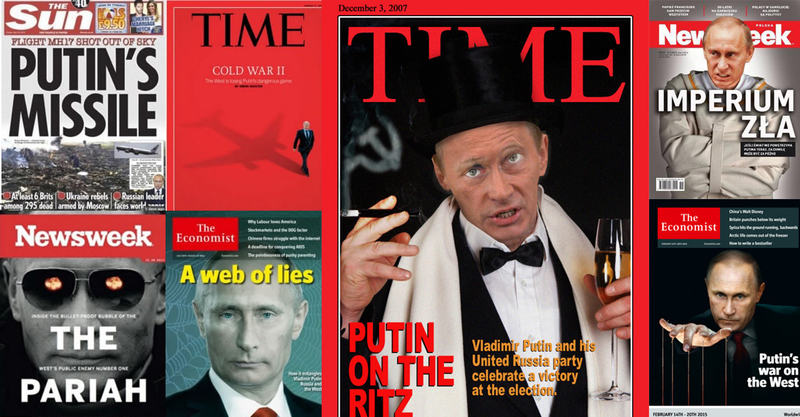 Draw your own conclusions as to why many Russia-focused commentators in the mainstream Western media leave out crucial pieces of information regarding the country’s media landscape. And what of Russian media consumers that some Westerners portray as incapable of critical thought? First, this country consistently ranks as one of the top places with the highest college-education levels. Second, its citizens are prone to question the media, per se, with their history of living behind the Iron Curtain. Although we should note that when it comes to the USSR, it was not that the disseminated information was not factual, but that it was often accompanied by a very particular, at times, inapplicable, ideological reading. Third, younger Russians are web-savvy, and many speak foreign languages. Of course, there is a number of popular platforms that translate foreign content for those, who do not. 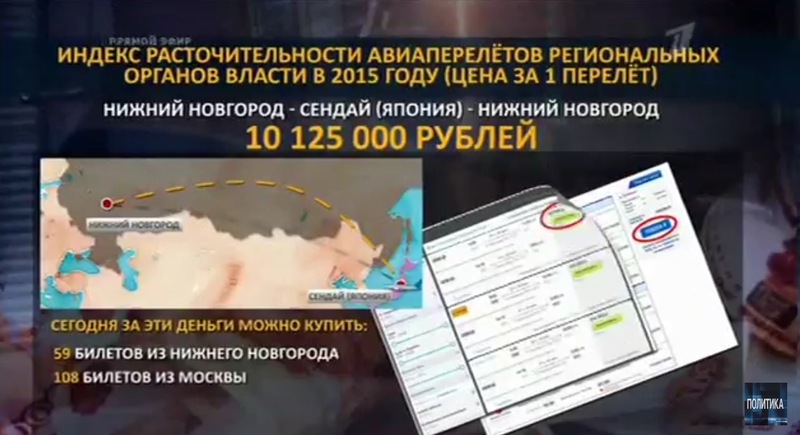 These platforms, InoSMI (foreign media) and InoTV (foreign TV), include many less-than-favorable Russia-specific articles and videos, in light of the current toxic anti-Russian climate in the official West. Now, how much Russian content does the Western media regularly translate in order to disseminate another point of view? Russian media is not perfect. Yet its overall landscape represents a real diversity of social, economic, and political content, most of which is actually found on state-owned channels. Indeed, the country’s citizens are likely better aware of Western opinions than Westerners of those in Russia. To some, this might come as a surprise, but only if they missed the fact that over the past two decades, the Kremlin has chosen the path of not just persuasion over staunch censorship, but also that of healthy debate. On the BBC ‘s newsnight there will be one (mildly) dissenting voice on the panel, and even then he/she’s shouted down by the hand picked audience! Their is no free speech in Britian! A superb analysis of the nature and quality of both reporting and political analysis in Russian as well as Western media. 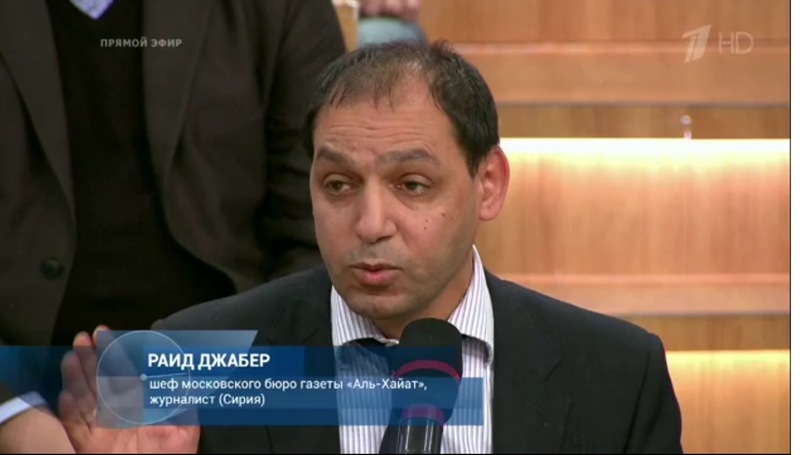 I watch a lot of Russian TV and this author makes some valid points. Alas, one stark omission is the quasi-controlled nature of the major Russian television media, where the majority of Russians get their information and where all are required to sing off the same song sheet. There may be different voices, and yes, the evening talk-shows often host the sacrificial western goat, who bleats loudly as he is usually consumed on-stage by the Kremlin’s true believers. 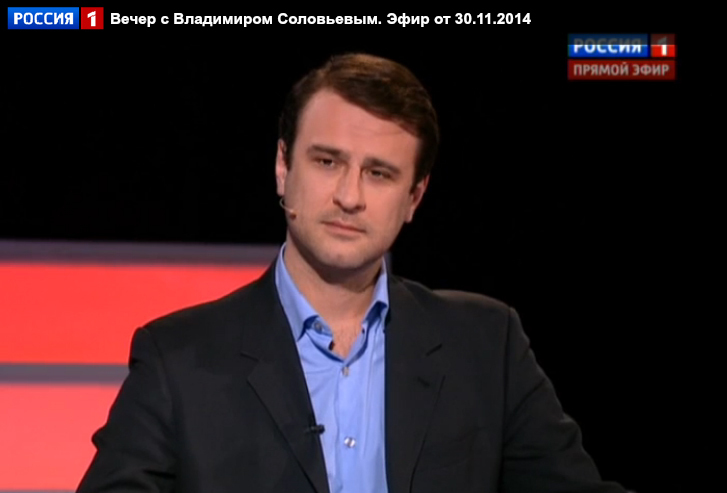 The major Russian media TV today is like Russian democracy (e.g. it’s all stage-managed). Russian opinion polls from non-aligned centers like Levada–which is indeed critical of Putin–demonstrate that the majority of Russians are supportive of the Kremlin’s foreign policy. This is what should be reflected on Russian political talk shows. Yet instead, this ‘stage-managed’ (sic) state media invites many more Kremlin critics from around the world (not just the West) than what would be necessary for your ‘sacrificial goat’ theory. And while we’re on that subject, which major Western, say, American, networks, regularly invite experts on live television that represent the dominant Russian (Iranian, et al) point of view even as the said ‘sacrificial goat’? I can’t think of any. Thanks for the reply. Having observed firsthand the media-madness that led this country into war against Iraq in the 2002-03 timeframe, not sure that the media should reflect what the majority wants. With the power of modern media possesses, the demos is easily misled. I don’t watch much American TV, but I sense that the overwhelming majority of my fellow citizens could care less about foreign policy or international issues. Even with our superpower pretensions, we remain a distracted, navel-watching people. PBS will occasionally provide a foreign perspective. Perhaps some enterprising young American entrepreneur will discover the profit potential in creating a talk show where foreign views can be aired and argued about.